Sometimes I get letters from former Evangelical/fundamentalist Christians who are also parents. "What do I say to my kids?" they ask. "I raised them to believe that without the blood of Jesus they are evil sinners. What a horrible thing for them to think! I feel guilty." "All of their friends are members of our old church, so we keep going. I don’t want to tear them apart, but it’s getting harder and harder for me to pretend." "When I try to talk to them they just cry. They think I’m going to hell." Polls show that more and more of us are questioning our received traditions, seeking to base both our personal lives and our public policies on reason and evidence. For parents, this brings some extra challenges. Changes that may feel rewarding to us personally can be confusing and scary to kids who love us. No matter what age the kids are, telling them your beliefs have changed or even that you no longer believe can be tricky. Here are three suggestions. 1. Help them to understand your changes as a matter of spiritual growth rather than spiritual abandonment. The bottom line is that moral and spiritual evolution are very much in keeping with the history of human religion, including Christianity. Every past generation answered our deepest questions as best they could. What is real? What is good? How can we live in moral community with each other? But every generation was like the blind men and the elephant. They were limited by their cultural and technological context – their point in history. Besides which, they, like us, were imperfect. By outgrowing the answers that were handed down to us, we honor their quest and continue their journey. 2. If your children are still at home, don’t forget that they may need a new community. Think about seeking out a moral/spiritual community that allows room for doubt or even atheism. A Unitarian church might be a fit, or a Quaker meeting or Ethical Culture Society. If you were in Christian fundamentalism, you may not know that within Christianity there are traditions that would allow your children access to familiar rituals and stories without feeding the belief that the Bible is perfect and their parents are doomed. Traditions I might look at include United Church of Christ, United Methodist, and Episcopal. All of these recognize the human handprints on the Bible and traditional dogmas—and they allow a humble, inquiring approach to the meaning of Christian faith. However, this very much depends on the individual minister. Openness to interfaith or "interSpiritual" work can be one indicator that a group doesn’t make exclusive claims about truth and salvation. Pay particular attention to whether your children would be offered explanations of the world that seem real and right to you, and whether they would have a group of peers. 3. Trust yourself, even when you are feeling your way in the dark, to be a spiritual guide for your children. As complicated and awkward as it may feel to find the right words for all of this, it’s worth it. You have the chance to model for your kids what it means to be a lifetime learner — someone who cultivates the curiosity and humility that can make it actually feel good to realize you were ignorant. Along the way, if you keep asking questions, you will be making some wonderful discoveries, and part of the delight can be sharing them. If you once gave your kids a fish, now you can invite them on a fishing expedition. Who knows what you might catch together! Valerie Tarico is a Psychologist in Seattle, Washington. 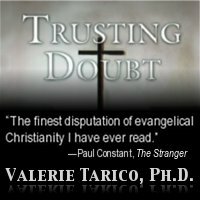 She is author of The Dark Side: How Evangelical Teachings Corrupt Love and Truth; founder of www.WisdomCommons.org; and host of Christianity in the Public Square, Moral Politics Television, Seattle.